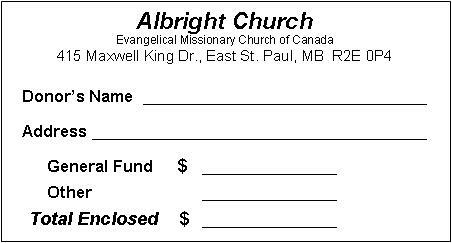 Thank you for supporting the ministries and projects of Albright Church with your gifts. Together we are impacting lives from our backyards to around the world. A tax-deductible receipt will be issued for all donations at the end of the calendar year. Stewardship Policy: Spending of funds is confined to approved programs of the church. Gifts designated toward a board-approved program will be used as designated with the understanding that when any given need has been met or where projects cannot be reasonably carried out, designated gifts will be used where needed most.